Founded in 2007 by Aaron and Michelle Eicher, I-Care provides commercial moving, warehousing, installation and reconfiguration of office space, home delivery, furniture repair and rental throughout Alberta. All staff and operations will relocate to the Matco office at 18151 – 107 Avenue, Edmonton. Aaron and Michelle Eicher will remain with the company for a period of time to ensure a smooth transition. EMERALD PARK, Saskatchewan — June 20, 2017 — Cratex Industries Ltd.,Western Canada’s largest packaging and crating company, today celebrated the official grand opening of its new facility at 9 Great Plains Industrial Drive, Emerald Park, Saskatchewan. The site was formerly the home of Balgonie Pallet & Crate Ltd., which Cratex purchased in February of this year. Local Cratex employees and customers, and senior executives from Cratex and its parent company Manitoulin Group of Companies attended the event. Guests of honour included Hon. Jeremy Harrison, Saskatchewan minister of the economy; Mitchell Huber, reeve, RM Edenwold 158; and Hon. Christine Tell, member of legislative assembly, Regina Wascana Plains. EDMONTON, Alberta — February 13, 2017 — Cratex Industries Ltd., Western Canada’s largest packaging and crating company, announced today that it has purchased Balgonie Pallet & Crate Ltd. located at 9 Great Plains Industrial Drive, Emerald Park, SK. Balgonie designs and builds pallets and crates primarily for the agricultural and food manufacturing industries. This purchase will enable Cratex to expand its existing business in those sectors and extend its reach in Saskatchewan and Manitoba, and eventually into the United States. MISSISSAUGA — Ontario — June 13, 2016 — Manitoulin Global Forwarding has bought M.A.P. International Freight Inc. of Vaughan, Ontario, a specialist in the movement of goods requiring a temperature-controlled environment be it refrigerated or heated. The acquisition rounds out Manitoulin Global Forwarding’s service offerings, enabling it to now provide clients with the full suite of international freight forwarding offerings available. 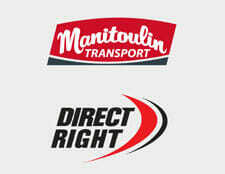 Mississauga, ON — May 5, 2015 — Manitoulin Group of Companies announced today that it has purchased Ridsdale Transport Ltd. of Saskatoon, Saskatchewan. The acquisition augments Manitoulin’s existing coverage capabilities in the province, positioning it as Saskatchewan’s largest transportation and logistics provider, with the most comprehensive portfolio of services. A family-owned firm, Ridsdale Transport has been in business since 1949. It has an extensive LTL service in the Saskatchewan market with additional service offerings in Alberta and Manitoba. Operating with approximately 400 pieces of equipment within its network, Ridsdale provides service to more than 200 Saskatchewan points of service via scheduled less-than-truckload (LTL) and truckload (TL) lanes, as well as a dedicated expedited pickup and delivery service to meet non-scheduled transportation requirements. Ridsdale also provides courier service and other specialized service offerings, including warehouse storage, container service and contracted transportation. Ridsdale Transport Ltd. will operate as a separate business unit within the Manitoulin Group of Companies under the leadership of Greg Ridsdale, vice-president. Wayne Ridsdale, the former president of Ridsdale Transportation Ltd., will remain in a consulting role. Manitoulin Global Forwarding Acquires Canfleet Logistics Ltd. of Vancouver, B.C. Mississauga, ON — December 2, 2014 — Manitoulin Global Forwarding has purchased Canfleet Logistics Ltd., of Vancouver, British Columbia. This is the latest of many strategic investments Manitoulin has made in Western Canada in recent years to build out its offerings and coverage in the region. The purchase of Canfleet, with its excellent export capabilities to Asia, also strengthens Manitoulin’s access to high-growth Asian markets, where many of its customers do business, and advances its overall global reach. Founded in 2005, Canfleet has established itself as a trusted provider of integrated logistics solutions, ocean freight operations, and global supply chain management to customers in the lumber, agriculture, scrap metal, and automobile export industries. It also provides refrigerated transportation for perishable goods. Gore Bay, Ontario — July 15, 2014 — Manitoulin Transport is the first transportation and logistics company in Canada to receive a certificate of compliance with ISO 14001:2004, an international standard that sets out the criteria for an environmental management system. This certification, which Manitoulin spent two years preparing for, demonstrates the company’s commitment to understanding and improving upon its impact on the environment. 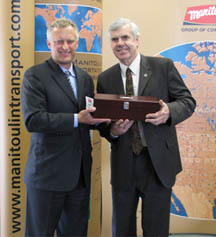 EDMONTON, Alberta – March 18, 2013 – Manitoulin Group of Companies announced today that it has acquired Cratex Industries Ltd., Alberta’s largest crating, packaging and export services company, based in Edmonton. This is the fourth acquisition Manitoulin has made since May 2012, demonstrating its continued commitment to building out a portfolio of services that fulfill the total supply chain requirements of its customers. Headquartered in Edmonton, with a facility in Calgary, Cratex has been providing professional packaging for the shipment of manufactured goods since it was established in 1989. A leading supplier to Alberta’s oil and gas technology services sector, the company’s offerings include: crating, skidding, poly wrap, container loading and unloading, mobile site teams and project packaging. Manitoulin intends to retain all Cratex employees, with Ron Holdinga, its former owner, staying on as president. Cratex’s customers will continue to have access to all of its offerings, and experience the same high level of customer service they have come to expect. MISSISSAUGA — Ontario – July 5, 2012 – Manitoulin Group of Companies has acquired its strategic business partner, Expedite Plus, a specialized service provider for the movement of highly time-critical shipments across the globe via air and ground. Manitoulin announced its partnership with Expedite plus, of Milton, Ontario, in October 2008, as a means to augment its own time-critical shipment capabilities. Expedite Plus will be a new division of Manitoulin Global Forwarding which now comprises global time-critical, international freight forwarding, warehousing and distribution. 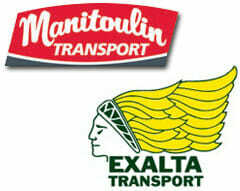 All Expedite Plus employees have transferred to Manitoulin Group of Companies. Customers of Expedite Plus can expect a seamless transition with immediate effect. Mississauga, ON – May 2, 2012 – Manitoulin Global Forwarding announced today it has acquired freight-forwarding company, Beler International Inc., of Regina, Saskatchewan. The purchase builds on previous acquisitions in Western Canada in recent years and demonstrates Manitoulin’s continued commitment to expansion throughout the region. Established in 1994, Beler International Inc. is the longest-standing freight-forwarding company in Saskatchewan. Exporting predominantly from the Prairie Provinces, it serves clients around the world in the agricultural machinery market place. Beler International’s previous owner and founder, Gerry Beler, and all former Beler employees, have transferred to Manitoulin Global Forwarding. Beler customers can expect an effortless transition to Manitoulin over the coming weeks. “It is very gratifying to see private investment such as his in Alberta,” said Luke Ouellette, “It is very gratifying to see private investment such as this in Alberta.” Alberta transportation minister, commenting on the event.